Richard O. Weijo, PhD, received an undergraduate degree from Concordia College in Moorhead, Minnesota, and went on to receive his MBA and PhD degrees from the University of Minnesota. He was an assistant professor of marketing at the University of St. Thomas in Saint Paul, Minnesota. Weijo was also a senior analyst at the Pacific Northwest National Laboratory, and he has been widely published on the topic of marketing and new product development for the energy industry. His most recent corporate position was as a marketing director at Portland General Electric. Currently, he is a consultant and a writer. He adores his young granddaughter Elsie, whose birth inspired the book, Our Dreams for Our Children. Author Richard Weijo, PhD, sees the seventy-six million baby boomers in America and the almost ten million in Canada as one sleeping giant, waiting to be awakened to the power of legacy. 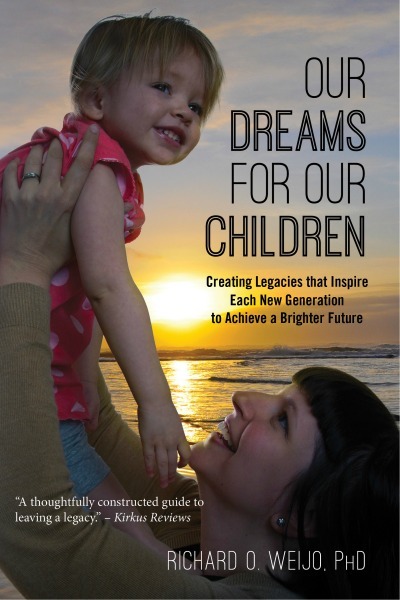 His book Our Dreams for Our Children: Creating Legacies That Inspire Each New Generation to Achieve a Brighter Future is a call to action. Three events awoke him to the power of legacy. The birth of his granddaughter, Elsie, inspired him to begin thinking about how to help her succeed in life. Learning he had prostate cancer reminded him of his mortality — and that every day is precious. And finally, while cleaning out drawers, he came across some old coins, many that had belonged to his father, a WWII veteran. These coins were one of the few remnants of his father’s past — and he had almost sold them off as if they were useless trinkets! Weijo realized that these coins had stories to tell — stories that could enrich his granddaughter’s life. Both he and his wife also had many of their own stories to share with future generations. These stories held knowledge and wisdom that would be lost unless he did something about it. Legacy is not an afterthought. Rather, legacy is proactive, the foundation for creating a brighter future. At the heart of this book is a detailed guide to planning and implementing a meaningful legacy - leveraging tools like journals, ethical wills (or legacy letters), life stories or memoirs, wills and living trusts – that can be sustained for multi-generations to come.